Ground meat, demystified by butchers. There are two main things you need to know about burger blends: First off, more expensive isn’t necessarily better. (Wagyu, for example, is totally wasted in a burger—more on that in a bit.) Secondly, there is no one right way to do things because everyone has different preferences for fat ratio and flavor. But what we—or rather, the butchers and chefs we talked to—will say is this: There are certain rules of thumb to follow to figure out how to create your preferred type of burger consistently and excellently every single time. And, obviously, a huge part of the experience of a burger comes down to the type of meat, or meat blend, you use. To help us navigate the overwhelming combinations and permutations therein, we’ve enlisted the help of Walter Apfelbaum, a butcher with three decades worth of experience. He's currently the executive butcher at Detroit steakhouse Prime + Proper. Read on for his tips on how to select the optimum burger blend. First rule: Just because you can splurge on Wagyu for a burger, doesn’t mean you should. Actually, just don’t. In fact, ditch the more expensive cuts altogether. 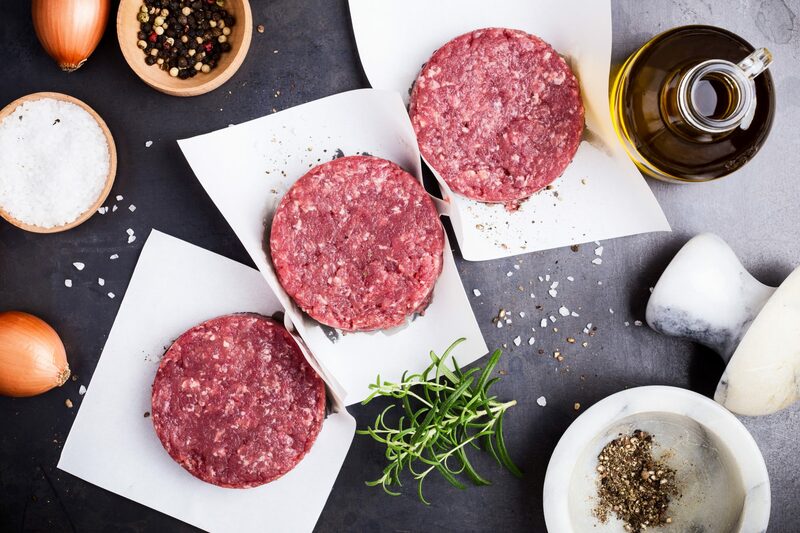 Andrew Sutton, head butcher at Curtis Stone’s Gwen Butcher Shop & Restaurant in Los Angeles, agreed that people have a misconception that the best steak money can buy automatically makes the best burgers as well. If you’re grilling burgers outside, you want a higher fat ratio than if you were pan-frying. Your cooking method, as it turns out, influences the type of beef you should choose. This makes sense, but it’s something that a lot of people don’t think about. You’re going to want a higher percentage of fat if you’re grilling, because you lose a lot of the fat on a grill when it drips through the grates. More fat will help create a juicier burger and a better crust. Another reason to choose a less fatty blend when cooking indoors, according to Apfelbaum: All that melted fat won’t set off the fire alarm when it reaches its smoking point. If you’re pan-frying your burger, go with 85/15 and work in more fat from there. Sutton is a fan of fattier blends, and he recommends 70/30. Just goes to show that tastes can vary significantly even among industry experts, and those tastes are legitimate. Apfelbaum’s recommended cut for pan-frying burgers indoors? Eye of round. If you're grilling your burgers outside, go with chuck. Fortunately, it turns out to be the cheapest. Chuck is from the well used shoulder muscle and is definitely a leaner cut, although chuck steaks can have a lot of flavor. Give aged beef a try. Sutton’s go to recommendation: 100% dry-aged chuck with a 70/30 fat percentage, cooked medium. Remember that you can really customize your blends. Don’t be afraid to ask your butcher to tweak them! For example, say you find ground chuck steak too fatty for the grill—you can always ask butchers to make it leaner, Apfelbaum advises. “A lot of times they’ll add something like an eye of round just to lean it out." They want to customize things for you—that’s what they’re there for. Take advantage of their expertise. Don’t be afraid to order a few cheaper cuts and play with the proportions in your kitchen, either. Still overwhelmed? Just go to the butcher counter at Whole Foods or Costco and ask for help.